Research in Motion will lay off 2,000 employees as it struggles to navigate a void in its product line-up as well as lower-than-expected sales. Research in Motion said Monday it will lay off 2,000 employees as it struggles to navigate a void in its product line-up as well as lower-than-expected sales. When the layoffs are complete, RIM will have about 17,000 employees globally. The company said that it will take a charge in its fiscal second quarter and exact figures will be disclosed when RIM reports earning Sept. 15. Along with the layoffs, RIM is shuffling its executive suite. First, Don Morrison, RIM’s chief operating officer who is currently on medical leave, will retire. Thorsten Heins will become chief operating officer for product and sales. In a nutshell, all product engineering—hardware and software—will be consolidated under Thorsten. Patrick Spence will become managing director of global sales and regional marketing. Spence will report to Heins. Robin Bienfait will become responsible to RIM’s enterprise unit. She is already RIM’s CIO focused on BlackBerry operations, customer service and corporate IT. David Yach, CTO of software, will focus on RIM’s developer relations and application ecosystem. Jim Rowan will be chief operating officer of operations and focus on manufacturing, supply chain and repair. Rowan and CFO Brian Bidulka will oversee RIM’s current cost cutting efforts. Overall, these moves are designed to help RIM “create greater alignment of the organization” and “streamline operations to better position the company for future growth and profitability.” However, RIM needs to get on the board with new products more than anything. RIM needs a hit device more than cost cutting moves. RIM co-CEOs Jim Balsillie and Mike Lazaridis took some heat from shareholders earlier this month at the company’s annual meeting. 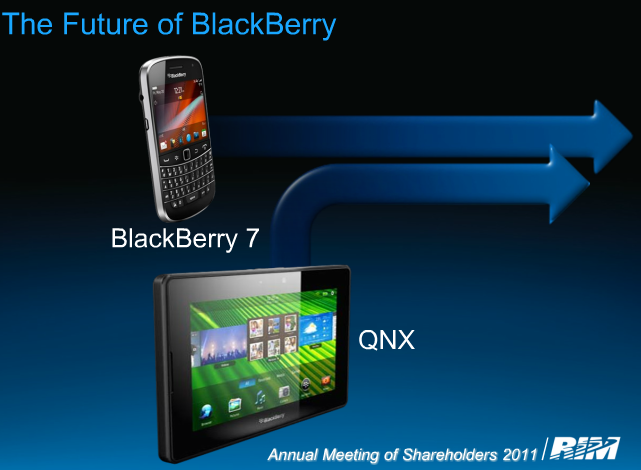 The co-CEOs talked up RIM’s upcoming BlackBerry OS 7.0 devices and the company’s next big product launches. The problem is that these devices are the warm-up act for so-called superphones powered by the QNX operating system. Some analysts are questioning the leadership of Balsillie and Lazaridis and have noted that RIM has missed key inflection points in the smartphone industry. Specifically, RIM has wrestled with the software integration with its hardware. In the meantime, RIM’s market share in the smartphone industry continues to erode. Today’s cost-cutting efforts are designed to help RIM hold the fort until its new products juice growth. At least that’s the plan of Balsillie and Lazaridis. RIM has made a series of acquisitions to better compete on the software front. For instance, RIM acquired JayCut last week. And last year RIM acquired The Astonishing Tribe, a user interface optimization firm. Before that purchase RIM bought Torch Mobile and QNX. Add it up and RIM is serious about software, but it’s unclear whether the company can master hardware, software and the necessary integration in between. Balsillie has argued that the next wave of RIM products will set the company up for the next decade, but skeptics abound. Vultures circle RIM management: BlackBerry 7 devices as savior? RIM’s conundrum: Convincing you to buy a BlackBerry 7.0 device?